As we enter 2019, we look back on SOEL with additional members, more classroom observations for the Essential Instructional Practices in Early Literacy, aligned book studies, our arts integration collaboration with UMS, and considering our past to plan for our future. Take a look at a few images we captured as part of our school year learning thus far. 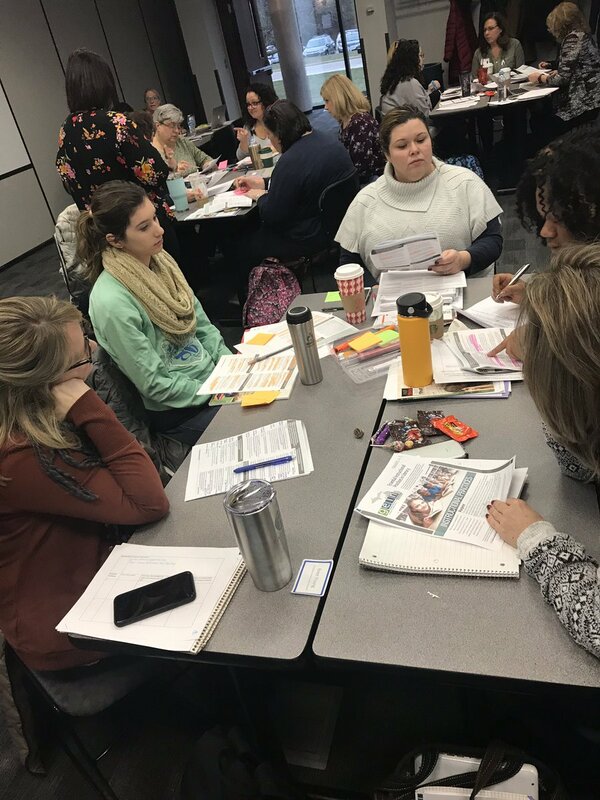 On December 5th, 30 literacy coaches and teachers came together for a one day overview of the Essential Instructional Practices in Literacy, Grades 4&5. Our theme for the day was "Shifts and Bridges". Together, we did a close read and review of these Essentials to identify shifts from the K-3 Essentials and bridges to the Grades 6-12 Essentials. We will host another overview in the spring, date TBD. Thanks to IDLL member Melanie Dever for organizing and hosting the December 13th meeting at Creekside Intermediate in Dexter. After reading the grades 4&5 Literacy Essentials and the 6-12 Disciplinary Literacy Essentials, we got a chance to observe in several 5th and 6th grade classrooms. This helped us to see the bridges from upper elementary to secondary literacy practices. Through a Success Analysis Protocol, we also elevated themes of success in disciplinary literacy instruction from IDLL teachers, and the student learning as a result. Our next meeting is January 17th as part of the Responsive Teaching Institute. While it is a regular meeting date for us, everyone is welcome to register . Our guests will be Dr. Ernest Morrell, Dr. April Baker-Bell, and Dr. Richard Milner. RESCHEDULED: The 4th in our SOEL Teacher Research Webinar Series with Dr. Cathy Fleischer will be on February 13th at 4:00. If you missed previous webinars, catch up HERE! Echoes & Reflections is dedicated to reshaping the way that teachers and students understand, process, and navigate the world through the events of the Holocaust. The Holocaust is more than a historical event; it’s part of the larger human story. Educating students about its significance is a great responsibility. We partner with educators to help them introduce students to the complex themes of the Holocaust and to understand its lasting effect on the world.